NASCARA champion Brad Keselowski squeezed into the cockpit of a Team Penske Indy car to take laps at Road America on Wednesday. Brad Keslowski’s wanna-do list: Win Sprint Cup championship – check. Drive a military tank – check. Drive an Indy car – as of Wednesday, check. 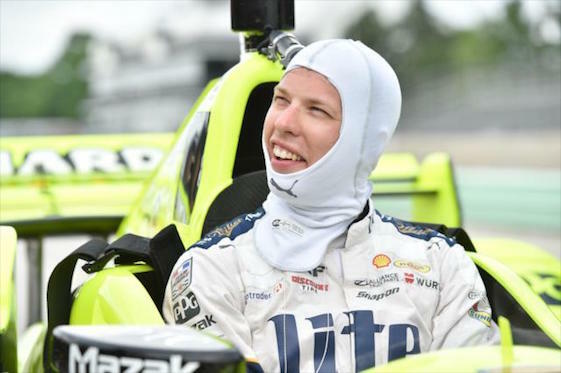 Keselowski, the 2012 NASCAR Cup champion, turned his first laps in an Indy car as part of a multi-team test at Road America, the 4.048-mile permanent road course that will play host to the the June 26 race, which is the next event on the 2016 IndyCar Series schedule. Keselowski, driver for Team Penske in NASCAR, climbed into the No. 22 Team Penske Chevrolet of teammate Simon Pagenaud late in the afternoon of a full day of testing that included 11 cars. The 32-year-old Keselowski enjoyed the experience. Pagenaud ran a few shakedown laps in the car before turning it over to Keselowski. Keselowski quickly noticed the difference in the handling and braking abilities of an Indy car compared to a stock car. “It sure was getting in the corners a lot deeper,” he said. “I think the Indy car just pulls so many G’s through the center of the corner and in the brake zone. You have to build confidence in it because the stock car does everything it can to wreck your confidence and in the Indy car it’s important to have confidence. So you have to kind of unlearn everything you learned in a stock car to be good in these cars. That’s a heck of a process but a fun one.